While the 645 Pursuit has been an enduring model for Fyran, its latest upgrade sees some significant changes that Fyran says make the boat an all-round better performer. These changes include a lengthened waterline, providing additional buoyancy aft to accommodate the weight increase of new-generation four-stroke outboards, and a much larger boarding platform. The new stern arrangement has seen the engine mounted directly to the platform. The increase in waterline length has been achieved by extending the hull aft under the transom and reducing the angle of attack at the bow. As well as being suitable for family fun, the new boarding platform size allows anglers to fish off the back, and makes it easier for divers. It stands to reason that the increase in waterline length should result in a more easily driven hull requiring less horsepower. This plays nicely into the hands of the budget conscious, with less up front fit-out cost and greater fuel economy from a smaller engine. The recommended engine size for the new 645 Pursuit is from 135 to 175 horsepower. Another notable change is the addition of a permanently welded alloy bait board, which includes provision for a ski pole. 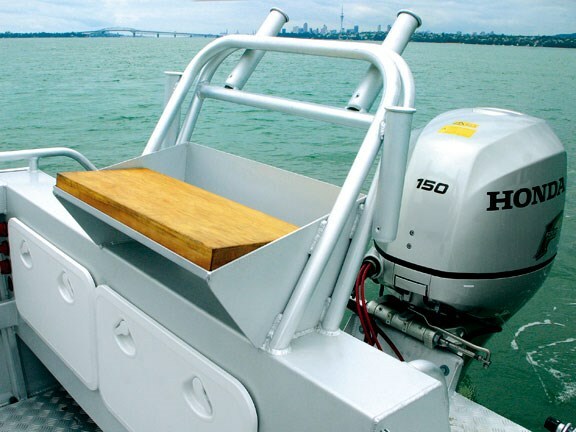 The 645 Pursuit is constructed almost entirely of marine-grade aluminium and utilises a mix of 5mm plate for the hull and 4mm plate for the topsides, cabin top and cockpit sole. 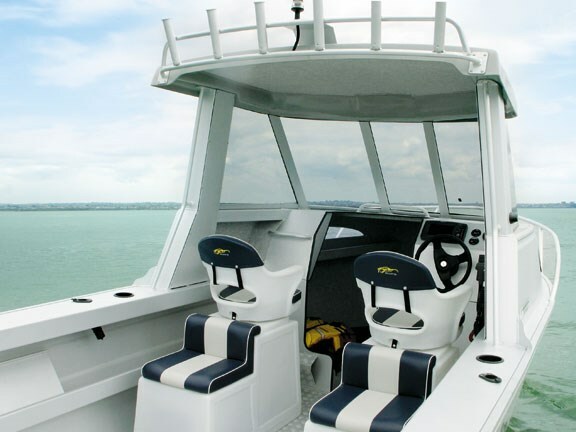 The topsides and cabin top are built on a jig and fabricated from CNC-machined alloy. The hull is solid, with six full-length box-frame aluminium floors running from stem to stern and athwartship stringers; all sealed and capped with a plywood or optional fully-welded 4mm checker plate cockpit sole. While this floor arrangement provides for a generous 150-litre built-in fuel tank, it does not allow space for any under-floor fish bins or dive tank storage. Like all larger Fyran boats the 645 Pursuit carries a voluntary Coastguard CPC rating. This ensures that it has adequate reserve buoyancy to remain afloat should it be swamped or capsize. Backed by Fyran’s five-year hull warranty, the overall standard of construction is reasonable given the boat’s starting price point. However, there is some flex in the cabin top when going forward, and there is little by the way of foot or hand support forward of the cockpit. The cockpit is simple and clutter free, with a single parcel shelf each side below wide box combings equipped with alloy grab rails on each aft quarter. A one-piece aluminium boarding ladder clips into place on the transom when it’s not in use. 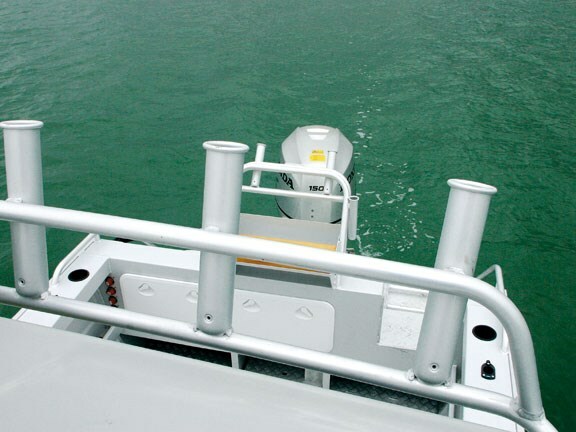 Transom access is via a port-side cut-out secured at sea with a simple drop-in gate that locates into aluminium slides. Optional fishing extras include an aluminium plunger and burley bucket. Changes to the cabin hard top include a longer cockpit overhang and wider sides. Seating options vary from single plastic swivelling pedestals to rotationally moulded king and queen seats with storage underneath. The 645’s helm station is simple yet practical, with the option of mechanical or hydraulic steering and room for a single eight-inch GPS/plotter and engine instrument cluster. The standard flat panel armour plate windscreen can be swapped out for a curved windscreen matching the radius of the fibreglass hard top roof. The cabin interior is fully lined and, depending on budget, carries vinyl or fabric covered squabs with storage under. The cabin is reasonably light and airy and offers good sitting headroom but marginal leg room. 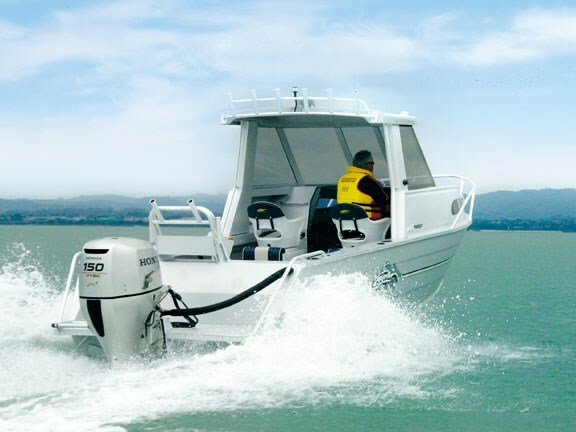 Fyran’s review boat was fitted with a Honda 150hp four-stroke engine. 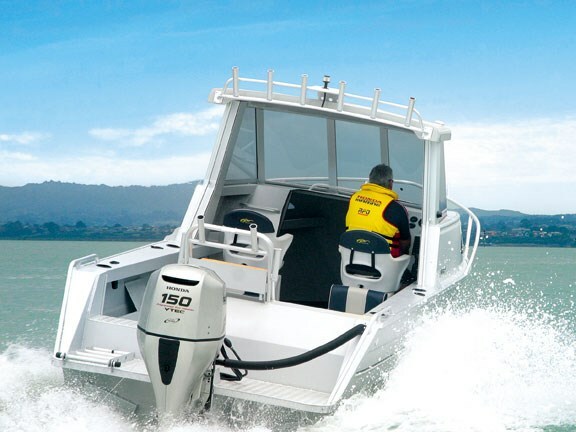 With a dry weight of 900kg (excluding outboard), the 645 is one of the lightest boats in its class, and 150hp is more than enough power and famously miserly on fuel. Two-up, the Pursuit makes no bones about pulling quickly and efficiently out of the hole and planes comfortably at about nine to 12 knots. The mechanical steering was surprisingly light at speed but tended to be a little less precise at trolling speed. Despite a flat calm and windless day the Fyran 645 had no obvious vices. The design changes are more likely to become obvious in windblown coastal chop where waterline length equates to comfort. The mid-range 645 Pursuit is reasonably agile and forgiving but like all hard top designs it tends to lean into the breeze, which ideally should dictate a requirement for optional trim tabs. With enough power strapped on the back there’s no doubt the 645 will live up to its promise of being an excellent competitively priced family boat with the wherewithal to venture further afield in relative comfort and safety. 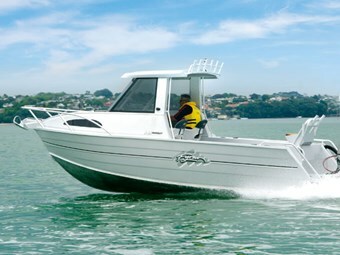 See a range of Fyran boats for sale.